Please make a note in your diaries for the 4 November 2018. We are having a fully guided tour to Bath and the Stonehenge. Departure from London is planned for 9am to allow travel from outside London. You may stay in London the night before and it may even be sensible for you to book return travel back from Bath rather than return to London to then travel home. 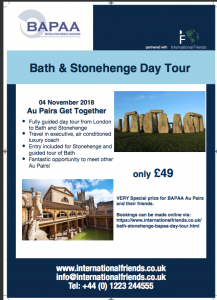 For au pairs residing in the south west of England, it will be cheaper for your to buy a single to London to travel up there on Saturday or early Sunday morning and then buy a single back from Bath to where ever (Exeter, Bristol, Taunton etc) rather than travel back to London and out again. We hope you will take advantage of this reasonable rate of £49 to experience a wonderful day and make new friends.